It’s our last day of State Fair Week (tear!). And what better way to end than with dessert? Now, I was going to do fried Twinkies. But at the last minute, I changed my mind. Why? Because 1) That required me to buy Twinkies, 2) It also required me to freeze Twinkies overnight. And I was absolutely prepared to do that, until an Anon (Hi!) posted the fried peach idea and I realized that I HAD fresh peaches on hand and could successfully avoid another trip to the grocery store PLUS have a fried peach right away. Laziness and Impatience for the win! And, oh, what a win. Pronto Pups! Imperfect, yes. But still beautiful. You ever notice how, from one state to another, there can be drastic vocabulary differences? I’m originally from the awesome state of Minnesota, where, for whatever reason, there are a few things that are just said differently. For example, growing up, I played Duck, Duck, Gray Duck (rather than Duck, Duck, Goose). It wasn’t until I was in college that I learned about the goose business. And it’s the same way with corn dogs: In Minnesota (and especially at the Minnesota State Fair), these babies are Pronto Pups. 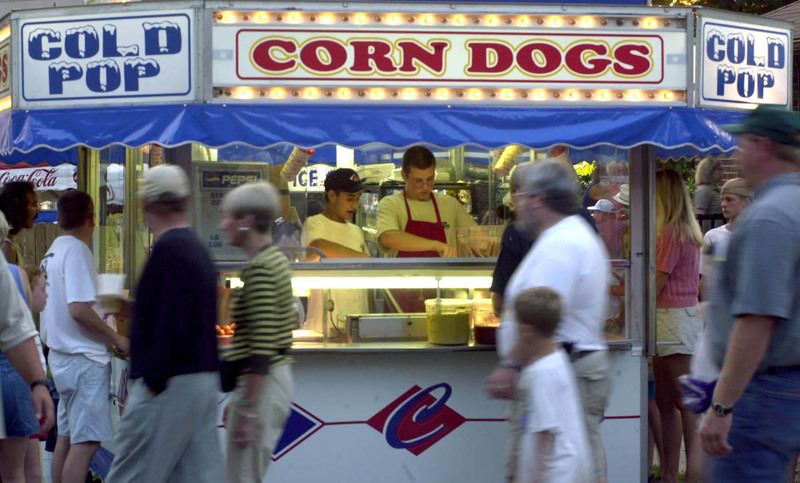 Not that you can’t find a corn dog in the Land of 10,000 Lakes, but you’re more likely to encounter a pronto pup. It’s just the way it is. But no matter what you call them, the hot-dog-wrapped-in-corn-batter-and-dipped-in-hot-oil is a quintessential fair food. It’s fried, it’s on a stick and it’s delicious. And so, of course, I had to make one for STATE FAIR WEEK. After the dual appetizers of fried pickles and mac and cheese on a stick, a pronto pup (a.k.a. corn dog) dinner is just about perfect. So, here we go! So, after you try the pickles and walk around a lot and perhaps take a spin on the Ferris wheel and maybe brave the line to see the butter cow, which puts you in a dairy mood, you might find yourself kind of hungry again. So, what do you eat? Macaroni and cheese on a stick. It’s the second course of our State Fair Extravaganza! It’s that time: IOWA STATE FAIR WEEK! Whoot! And to celebrate (well, to celebrate in a way OTHER than actually going to the fair, which I sadly may not have a chance to do this year), I made a veritable litany of fried and on-a-stick foods, DIY versions of what’s sold at the fair. My waistline may never forgive me, but my taste buds just sent me a dozen roses. Yay. So really, to get the best feel for this, let’s pretend we’re at the state fair. You with me? You just got here, you’ve seen the super-huge bull and your favorite breed of horse (or chicken, if you’re Rob) and now you’re walking along, counting the number of fanny packs you see, and your nose detects the scent of something… tangy, yes, it’s tangy and also definitely fried. It smells delicious. You wander over to the vendor’s stand and find out that it’s fried pickles! Let the eating begin. First, an apology. I have been somewhat remiss in my blogging duties of late, largely because my life has become consumed with real estate issues (buying a house and moving into it, and renting out our existing house). The bad news? 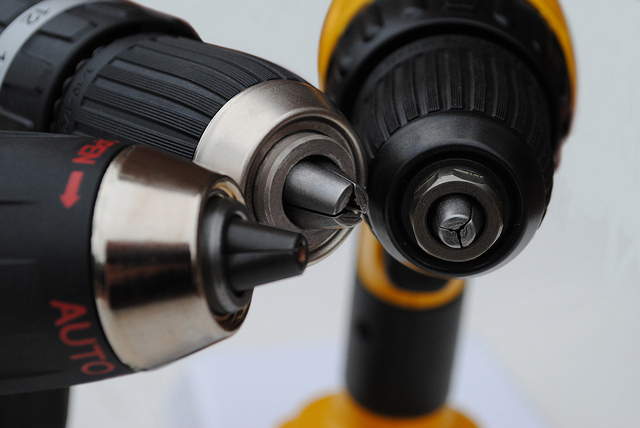 I’m missing DIY or Buy analysis posts. (It’s hard to type when you’re covered in paint.) The good news? I have DOZENS of posts-in-the-making. So, please forgive me and bear with me. And to reward your patience (and give myself a much-needed mental break), I’ve deemed next week STATE FAIR WEEK on this here blog! 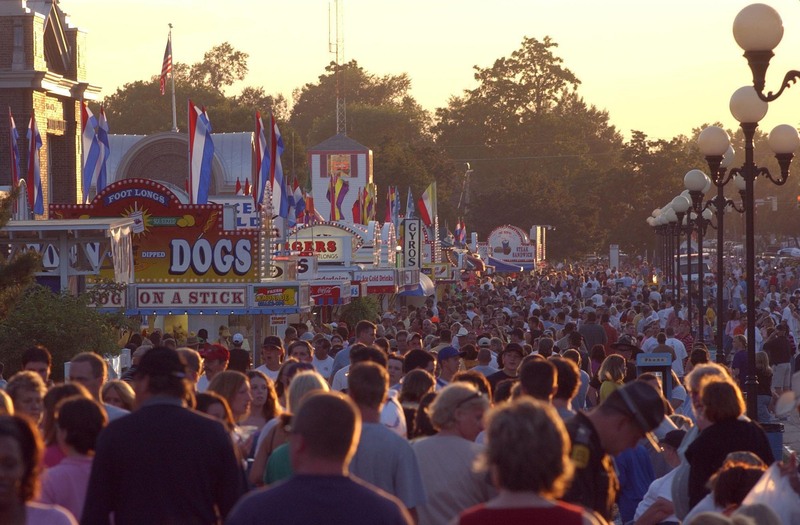 Yes, the Iowa State Fair begins on Thursday and runs through August 21st, and it is one of my favorite things about Iowa. There’s the world’s largest pig (which is a wonder, but also makes me a little sad, because they always look so hot and uncomfortable) and the horse stables, and the giant cow fashioned entirely out of butter, and the photography displays, and the cake-making competitions, and the concerts and the midway and, oh, the food. THE FOOD. State Fair food. I love State Fair Food. So, we’re totally making it. Anyway, the regular stuff will pick back up with the Aug. 23rd post – I promise. But I’m going to take a week to indulge in epic amounts of food experimentation and goofiness. Please join me! And, if you have any special I-want-to-see-it-made requests, let me know in the comments. I’m easily swayed.